Actor, comedian, avid amateur golfer, and extreme music fan Bill Murray was in Ft. Worth, TX on Wednesday (5-23) participating in this week’s PGA Golf event, The Colonial Invitational. Murray was on the links on Wednesday playing in the event’s pro-am festivities and glad-handing fans in the gallery. But after Wednesday’s Colonial duties, Murray ventured out to take in some of the local music talent that Texas and Ft. Worth are famous for. After first stopping by The Longhorn Saloon in the town’s historic Stockyards District, the comedian sauntered into nearby Filthy McNasty’s to take in a songwriters night that featured up-and-comer Skylar Payne, Clete Bradley of Clete Bradley and the Mood, and songwriter Zach Coffey. Skyler Payne hosts the guitar pull each Wednesday night with a revolving lineup of guests. Bill Murray is known for showing up randomly at music events, being unable to contain himself, and doling out random acts of musical kindness. Previously Murray has been caught red handed going nuts at Chris Stapleton concerts, and is a huge fan of one of Stapleton’s first projects, the hard-driving bluegrass band The SteelDrivers. In November 2017, Murray attended a SteelDrivers show at the Charleston Music Hall in South Carolina, promptly cutting in line and purchasing all the remaining tickets for the show and handing them out to fans as they walked through the door. That’s awesome. The only interesting guy I remember watching me play at Filthy’s was a really nice drug dealer with a glass eye. He loved Leon Russell. Wonder what Landon Dodd thought? 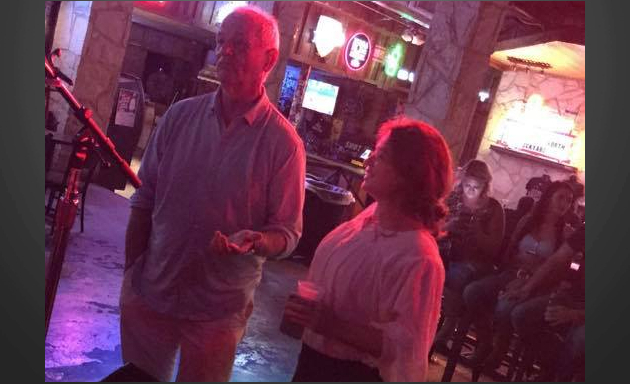 Bill Murray lives 3 miles from me. He’s a really weird dude. Not mean or anything, but really odd. Longhorn Saloon is a quintessential Texas dancehall and live music venue. I caught a Gary P. Nunn show there 6 months ago while I was in town for a car race. It was more fun than the racetrack. Gary is so great live! Bill Murray seems like a weird guy but he is hilarious and his heart seems to be in the right place. I always enjoy stories like this, thanks for writing about these events. I think my favorite Bill Murray story is somebody recognizes him at a fast food joint, McD or BK I bet. I have a huge book of Bill Murray stories. Very nice of Bill to do this. If he’s a little odd, that might be part of why he’s so much funnier than almost everyone else. It’s second nature to him. Many extremely talented people are oddballs. Seems to go hand in hand.